The Switch, a Finnish manufacturer of permanent magnet motors, generators and converters, announced the launch of its next-generation drive trains for energy efficient power generation and propulsion of merchant vessels. Combining The Switch’s permanent magnet and frequency converter technology, this opens up all-new opportunities for hybrid propulsion systems in the shipping sector. Next generation electrical drive trains based on permanent magnet (PM) technology from The Switch, provide advanced control with a permanent magnet motor and a frequency converter as the major components. The controller acts as the brains for energy efficiency, keeping the network stable regardless of external conditions, such as waves, speed and other influential factors. According to the manufacturer, this solution enables vessels to produce electricity with better efficiency for the entire ship’s network, lower costs by keeping auxiliary generators off – and allow the main engines to operate at variable speed and generate electricity. In total, it represents operational savings for vessels with four-stroke, but in particular two-stroke engines, and helps to comply with future environmental legislations. “Soaring fuel prices, global overcapacity and lower profit margins are forcing shipbuilders to rethink conventional power configurations. This has opened the way for advanced technologies that are revolutionizing the way ships generate and use energy for the good of the environment. Our drive train technology is a game-changing opportunity for hybrid propulsion systems, namely in the large merchant shipping sector, where two-stroke main engines are the preferred type of prime mover. It will enable ship owner to save up to €50,000 per month in fuel costs, which may add up to 7% more profit per year,” said President and CEO of The Switch Jukka-Pekka Mäkinen. Permanent magnet generator technology, with its unmatched design flexibility and energy efficiency, has gained a very successful track record in many other industries. Thanks to their higher power density, PM machines can be more compact, lighter in weight and smaller in size. They have proven their high reliability and durability under extremely harsh operating conditions. 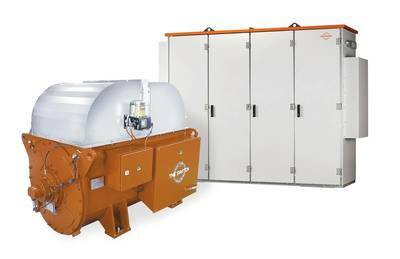 The Switch PM machines deliver excellent performance with corrosion resistance and temperature tolerance. Adding a frequency converter to a shaft generator allows a ship to control its speed and ensure a stable source of electricity for the ship’s network. The frequency converter allows the ship to choose between taking power from the main engine or from the auxiliary generators, as deemed best. A PM machine gives high-efficiency performance over the entire operating range, significantly cutting back on fuel consumption. It is typically 2-4% more efficient at full load and 10% more efficient at part loads compared with induction machines. These efficiencies result from a lack of current losses in the rotor, the absence of an exciter, and reduced winding losses. A synchronous PM machine contains Neodymium-Iron-Boron (NdFeB) magnets, which are materials with a very high flux density, which makes them ideal for variable speed generators throughout the entire speed range. The magnetic field is created with almost zero rotor losses. Thanks to the improved high density, the size and weight of the drive train can be substantially reduced. This leads to greater flexibility with the limited space available in ship configurations. The Switch, together with its partners, can provide ship designers and builders with turnkey deliveries for the most energy efficient operation in the challenging marine environment. Additional services include design consultation for selectivity, project management, and the capability to deliver integrated solutions for new build ships or upgrades of existing fleets.